This is a unique Hereford building, iconic: a splendid example of mid-Victorian Gothic. It is a landmark in the range of buildings in Broad Street. It houses the county library, the Hereford museum and an art gallery. It was originally built in the 1870s largely due to the generosity of James Rankin, a founder of the Woolhope Club, which is still housed in the building. Now disaster has struck, for during building works asbestos was discovered and the entire building is currently closed to the public. It will cost a substantial sum of money to put right. But even then it will fall way below the standards expected of a county library and museum. For the building has been neglected for years, for decades. 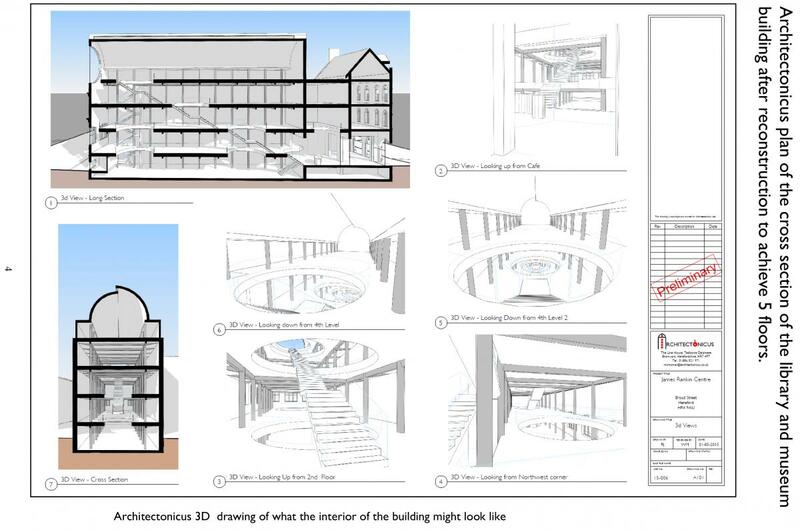 The Hereford Library Users Group believes there is a unique opportunity to bring the building into the 21st century. The User Group has been invited, with other interested parties, by the Hereford- shire Councilâ€™s Cabinet to explore how it might be best developed into a 21st cen- tury innovative, cultural and community centre for the city. With radical thinking and the employment of the full resources of the digital age, it will be possible for this building, which we propose should be called The Rankin Centre, to take on an entirely new lease of life. It will be revitalized by a number of unique innovations using synergy between the library and the museum collections. It will become, again, a major attraction for residents and tourists alike, worthy of Hereford and Herefordshire. What follows is an entirely new concept in the heart of the city of Hereford. The present building is the countyâ€™s central library and houses the main museum in the county. At present it fulfils neither of these functions adequately. It should become a major focus for cultural, educational and information seeking activities in the city and the county, as well as an attraction for tourists. The proposal has a number of distinctive innovations that include a new way of integrating library and museum offers, and a better way of accessing the library resources by introducing the concept of â€˜discoverabilityâ€™, including an informed gateway to archive sources. Over the next few years Herefordshire could have a new and innovative university which will require a library facility. There is also an intention to apply to be a Euro- pean City of Culture but the poor quality of what is at present on offer would al- most certainly disqualify any bid. This major omission must be dealt with for the bid will fail in the absence of a first rate library and museum. The Library Users Group proposes a cultural and information hub to bring together community ser- vices, a meeting place for young and old, tourism, business support, digital access, a modern library display and meeting areas and with links to services such as mu- seums and archives â€“ a real hub for the county. There are excellent examples of such centres elsewhere, such as at the Norwich Millennium, Centre, the Winchester Discovery Centre, The Hive. Worcester, Brightonâ€™s Jubilee library and the Tower Hamlets Idea Stores, all of which have been extraordinarily successful in rejuvenat- ing and inspiring the communities they serve. Such a centre in Hereford would support and reinforce the positive effects that the establishment of a university will bring to the county. The key to the proposal is a complete re-development of the interior of the present Broad Street building, with its listed and striking Victorian Italianate faÃ§ade, which is in an excellent location in the heart of the city. However, the building is quite inadequate for a modern library and museum and is unable to provide the facilities that a 21st century cultural hub needs. It does not attract people to use it as is evi- dent from falling numbers. Present use of space, access and services is poor and is a gross under utilization of a prominent city centre site. The inner structure of the library needs to be torn out and a completely new arrangement of floors and access between them set in place. See the architectâ€™s outline section, below. Full details in the attached PDF below. Amazingly thorough and well considered report by the authors - in their own time and at their own cost. Consultants would have charged the Council Â£0.25m for this. Straightforward, common sense approach to yet another denigrated council service - lets hope the council have the good grace to give it a fair hearing and run with it. Parking is not brilliant at and near that building .... I wouldn't throw a shed load of money at that building because of it's current condition and lack of parking. Great to see such positive plans put forward. It looks as if the centre could house a fair few community groups. Encouraging to see that CAB have been included. All very positive in the proposal, good to see. I must say that I am in two minds about this. Yes it is a brilliant idea to bring everything together and get all the services in one place. However, I agree with Roger, that there is little parking nearby. Could not the money,whatever that is, be spent on a totally new build for library, CAB etc. and keep the old library, after asbestos removal, for a museum and Tourist Office. Not being an accountant, ask my Bank Manager, I have no idea if this is financially viable, but, as mentioned, the new University, and it will happen, will need an extensive library just for themselves, so may be a new building, costs split between University and Council could be the answer. That said, I gather that a lot of the new University lodgings and study rooms will be fairly close to the city centre, so the new library would also need to be similarly located. That may be a problem. there is little parking nearby. The fact is, it may not be perfect, but this is the one and only chance we will have of getting something half decent - the Council have (finally) asked the Library User Group to produce this feasibility study and they've done it - it proves it is feasible. Only the original front part of the building is listed - the rest will ail be demolished and replaced with 5 floors of modern space. I know the authors and how much they've put into it - and they're convinced that a change is coming in the legal status of libraries anyway, such that Council's will no longer have to provide them. So, we take this now or we really do lose the library for ever. As for parking, it could be an issue, but for many who use the services listed, they may already be in town, or don't have a car, or walk or cycle. It's a case of we can't have everything, even though the Council promised it back in 2007 - remember the glorious promises of the ESG and the â€˜20 Year Visionâ€™? New library, new civic quarter - still waiting, 9 years later â€¦ I'll take this over hollow promises any day. If this is the case, Two Wheels, and changes are indeed afoot to alter the legal status, then that's even more of a reason for supporting these plans. I've just left a comment on the HT letters page, regarding this. Thinking ahead....I quite liked the idea the Cathedral folks had a few years back, when folks could "sponsor a stone". I think something similar to this could prove quite a popular way of raising much needed funds. Perhaps a 'word wall' where folks could pay a recommended donation to write their name and favourite book, or quote? It would certainly allow many people, of all ages, to really feel that they had some "ownership" over this project. It would be a lovely 'community' led thing to do, and something for future generations to see. Families could go and sign together.... in years to come, children could show their children where their names were!